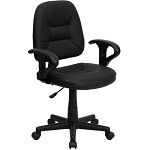 Leather Office Task Chairs - BT-688-BK-A-GG Mid-Back Black Ergonomic Chair. Free shipping to the lower 48 United States for this Flash Furniture leather office chair. Are you looking for comfortable office chair for your long work days? The BT-682-BK-GG leather office chair from Flash Furniture features the ergonomic contoured feel you are needing. With Flash Furniture's LeatherSoft upholstery and ergonomic back, you will be working in much more comfort that you previously though possible. LeatherSoft is a combination of leather and polyurethane, providing you the comfort and feel of leather with the longevity of polyurethane. The seat height is adjustable up and down allowing you to set the height to the most comfortable level. This office chair comes with a 2-year parts warranty from Flash Furniture. Comes with a 2-year parts warranty from Flash Furniture. Seat Size: 19''W x 17 inches D.
Back Size: 17.5''W x 18 inches H.
Seat Height: 17.5 - 22.5 inches H.
Arm Height From Floor: 23.5 - 28 inches H.
Arm Height From Seat: 6 inches H.
Overall Width: 23.5 inches W.
Overall Depth: 24.75 inches D.
Overall Height: 34 - 38.5 inches H.
Shipping dimensions: 23 inches x 15 inches x 23 inches. Q: Can this chair lean back? A: This chair does adjust up and down, but it does not tilt back or recline. Fast Shipping: Orders for the Flash Furniture BT-688-BK-A-GG generally leave the warehouse within 1-2 business days.